Talk about rainy day music. 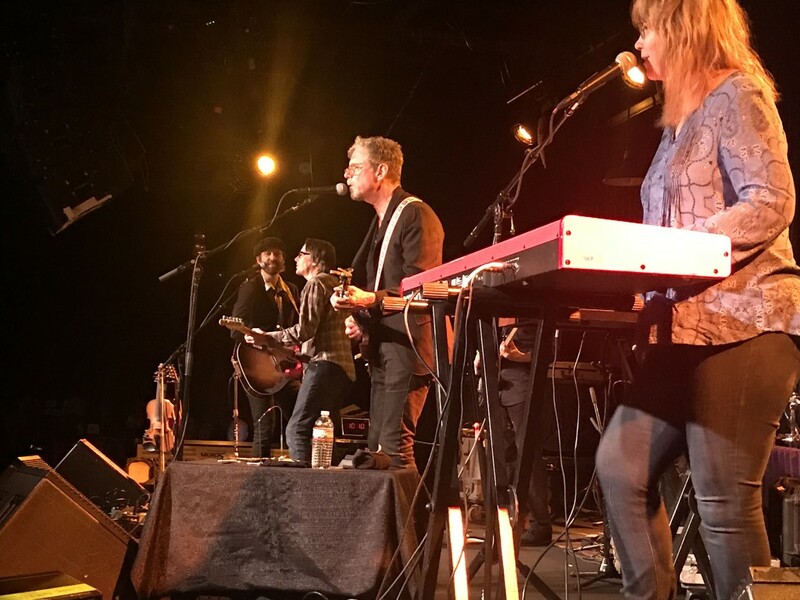 The last licks of Hurricane Michael were blowing rain into Virginia the soaking night of the Jayhawks’ return to The Birchmere. But also it was heard a lot because guitarist Stephen McCarthy had driven up from Richmond to join them on several songs. He was with the band right around that era, and the more twangy style from the former Long Ryders guitarist lent a more country bent to the show — though he only brought along his electric, not his steel guitar. Still, the combination of Louris on acoustic, newest member John Jackson on mandolin and McCarthy on electric made a strong stringed front — just as the combination of Louris, keyboardist Karen Grotberg and drummer Tim O’Reagan on vocals created ringing harmonies. The country slant had Louris surprise Grotberg by suggesting the straight country cover they occasionally do, “I’m Down to My Last Cigarette” on which she shines both on voice and honky tonk piano. There was country too in the Dixie Chicks and Natalie Maines solo songs that Louris co-wrote that they also recorded for the newest Jayhawks album Back Roads and Abandoned Motels. The Jayhawks by now are a solid and reliably strong folk-rocking outfit with so much strong material from which to pick, there is nary a wrong move or a lull. Because a lot of his cousins from the area had come to the show, O’Reagan was sure to sing a couple of songs, including his “Tampa to Tulsa” (which is also from Rainy Day Music). Just as the band has shown itself as a reliable backing unit on Ray Davies’ last two solo albums, Louris has become an in-demand co-writer of songs and the show had a few of those from new album as well — including “Gonna Be a Darkness” that he co-wrote with Jakob Dylan for “True Blood” (which Louris claims he still hasn’t seen). Harrow Fair, for their part, were an unusual twosome. With Andrew Penner on growling vocals, atmospheric guitar and also playing bass drum and hi-hit, one-man-band style, they kick out a lot of rootsy sound, though their voices don’t blend that well together. Having just driven down to the show from their home base of Toronto, they brought a few covers in addition to their originals. One was a wrong headed version of Chris Isaac’s “Widked Game.” Another spoke to the rainy conditions as well, Memphis Minnie’s “When the Levee Breaks,” better known from its Led Zeppelin cover.